At first glance one wondered if this was a political statement or the obvious? 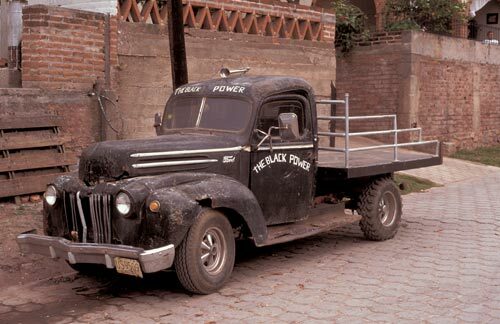 The Black Power was on the streets, always recognizable, during the 13 years span of my Álamos project. In late August 1996 it was the platform for a wonderful project over several nights. Victor, owner of The Black Power, Antonio Figueroa and yours truly went on a tour of the barrios and projected my slides onto a wet sheet nailed to a homemade frame on the truck’s flatbed. The best shows were in the arroyos: kids sat on rocks, mothers in folding chairs and men stood in the back swaying in the sweet night air. We asked each audience to help us identify people in 80 projected images. We were able to write names for 50 pictures into a small pocket notebook. That notebook has become an important reference element for this journal effort. A good time was had by all. The audiences enjoyed seeing their friends, families, barrios, plazas, mountains and all things Álamos. The Black Power, a wet king-size sheet, 80 images, a 200 ft extension cord, slide projector, boom box and beautiful open air theaters, under the stars, came together for a special week of spontaneous entertainment. Our light projection team enjoyed watching audience faces and hearing their reactions. This beast of burden has many miles on it, each trip out an adventure. 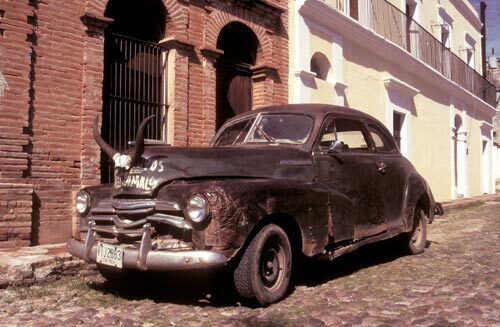 Is this the car that Levant Alcorn drove into Álamos in the mid 40’s? I was told so, but who told the person that told the person that told my friend that told me? I do know Levant had owned and operated a farm and antique shop in Waterford, Pennsylvania before setting off to Mexico. He attended Cornell University but didn’t graduate. The first two Álamos properties he purchased were a packaged deal for $3,000 USD with the Bours family. And that began a new life for Levant, who at the time didn’t speak Spanish, and Álamos – Levant understood and put a value to the ruins. The last time I saw this car it was braving its way across a flooded arroyo with a trailing wake quickly washed downstream by fast flowing water. I wonder if it is still running, or if any of its parts are still being used? Speaking of icons, the VW Beetle survived multiple eras. A fancy of man and engineering, this stretched Beetle is. Talk about a mixed metaphor. And my questions are, what became of this hybrid? Was the body finished off and painted? Did it run then and is it running now? And when was the moment and what was the creator doing when he visualized stretching a VW Beetle. And how long did it take him to realize this dream? Salud! 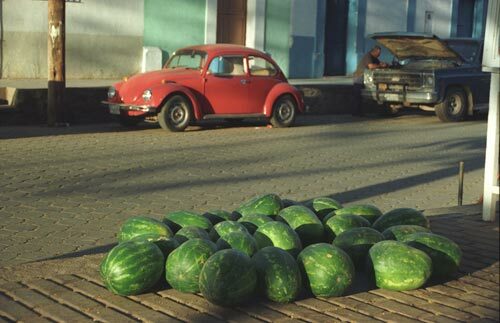 Red VW, green watermelons and long Alemada afternoon shadows. 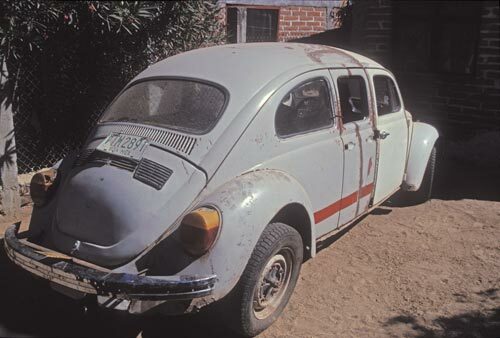 Volkswagons of all color and conditions are part of the Álamos community. They are seen going from here to there on rural dirt roads and on Álamos Centro cobblestones. Álamos and Scottsdale, Arizona are sister cities. 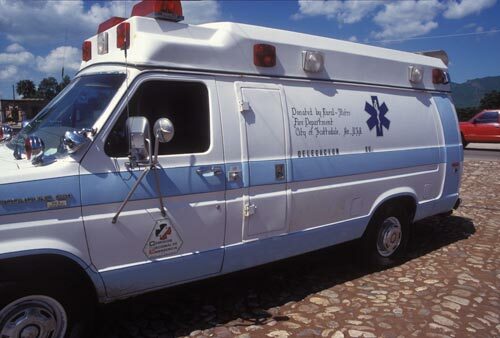 A Ford Econoline 360 ambulance donated by the City of Scottsdale, Arizona’s Rural-Metro Fire Department sits on Calle Francisco Madero, the main road-highway to Navajoa near the Álamos General Hospital. The storm has passed, the sun is out, and normal returns. The September 1996 Hurricane Fausto has passed over Álamos, Sonora, Mexico on its way to Texas. The rushing waters are receding, We are watching the Arroyo La Aduana from the Miguel Hildago y Costilla crossing just west of the Alameda. 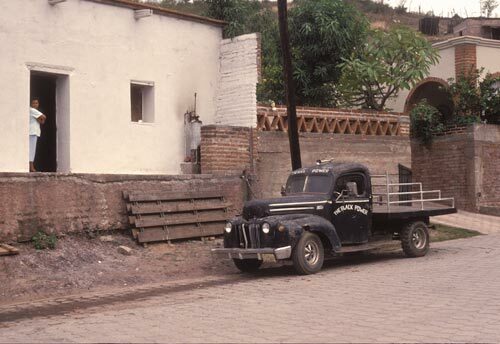 It is the Spring of 1995 in Álamos, Sonora, Mexico on Calle Hildago. Workers and walkers go about their business. The barrio is alive with sound: hammers, trucks, cars, school kids, dogs and birds. Anders has added his drums and a keyboard track by Denver Clay to the sounds of Álamos.